Fear of heights is quite common and often comes with other types of phobias. Psychoanalysis considers phobias as an excessive ansiety in particular situations but also a kind of defense against more primitive kinds of anguish. It may seem pradoxical, but fear of heights often goes along with attraction for dangerous situations. In cinema, "Vertigo", the movie by Alfred Hitchcock, is a particularly disturbing illustration of this kind of psychic phenomenon. 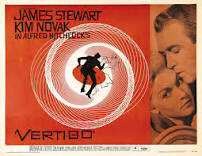 Vertigo was recently voted the best film ever made and those who saw it know why. No the movie, James Stewart is an ex-cop who has a paralysing fear of heights. He suffers from vertigo but also from a particular attraction for dangerous situations - and dangerous women. The photos below come from a BuzzFeed link and don't have anything to do with the movie, except for one. They are of specially beautiful and vertiginous stairs. Hold on to the handrail!